There is an ever-increasing amount of plastics in cars these days and, no matter how careful you are, some of these plastics were never meant to be removed and are prone to breaking, leaving you with trims and other parts that no longer fit quite right. Plastic Bonder from J-B Weld is a quick setting structural two-part urethane adhesive that sets in 15 minutes and sanded after 30 minutes. Plastic Bonder works on thermoset, thermoplastics, carbon fibre composites as well as a wide range of other surfaces. 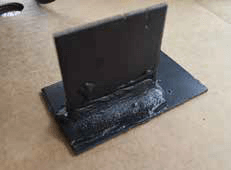 Unlike other Plastic Weld products that cure to a rigid bond, Plastic Bonder has some flexibility in the bond after it has cured making it an ideal product to use when repairing plastics in areas of continual vibration. For this test the Plastic Bonder was used to join a broken trim clip, a leaking washer bottle and to test bond strength in metal-to-metal bond. The Plastic Bonder comes as a syringe that was easy to use straight out of the packet. The clear plastic top clam packaging becomes the mixing tray and a mixing stick is also included. Just make sure to mix equal parts of both urethane and hardener, as unequal pressure on the plunger will lead to a disaster later as the urethane will not cure and remain tacky. The syringe comes with a re-sealable no waste cap that has a locating tab to ensure it is fitted correctly so you don’t inadvertently seal off the syringe. 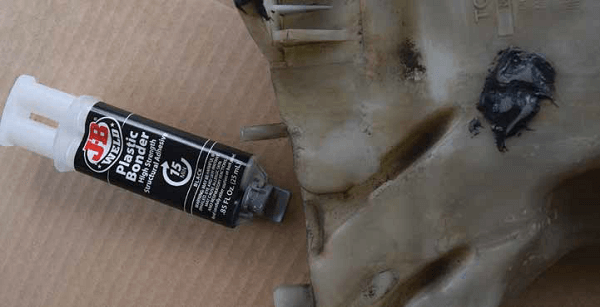 Surface preparation is important to make sure you get a solid bond. To achieve a good result clean both surfaces then roughen with sandpaper. After applying and joining the surfaces of the trim clip and filling the crack in the washer bottle, fifteen minutes later the bond was set. I left the Plastic Bonder a bit longer than thirty minutes before sanding just to be sure it cured correctly. When cleaning up use an alcohol-based cleaner. The results were impressive with the trim clip resecured and the leaking washer bottle repaired. Even the metal-to-metal join was quite strong. 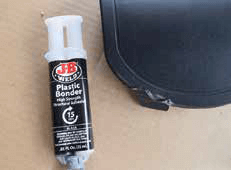 Plastic Bonder from J-B weld would be right at home in both the automotive and panel beating workshops with applications ranging from joining plastics to filling cracks or small dents. It would be advisable to keep some Plastic Bonder in your toolbox for the next time you need to repair something plastic.